Ambassador Morgenthau's Story. 1918. Chapter Sixteen. Probably one thing that stimulated this German desire for peace was the situation at the Dardanelles. In early January, when Wangenheim persuaded me to write my letter to Washington, Constantinople was in a state of the utmost excitement. It was reported that the Allies had assembled a fleet of forty warships at the mouth of the Dardanelles and that they intended to attempt the forcing of the straits. What made the situation particularly tense was the belief, which then generally prevailed in Constantinople, that such an attempt would succeed. Wangenheim. shared this belief, and so in a modified form, did Von der Goltz, who probably knew as much about the Dardanelles defenses as any other man, as he had for years been Turkey's military instructor. I find in my diary Von der Goltz's precise opinion on this point, as reported to me by Wangenheim, and I quote it exactly as written at that time: "Although he thought it was almost impossible to force the Dardanelles, still, if England thought it an important move of the general war, they could, by sacrificing ten ships, force the entrance, and do it very fast, and be up in the Marmora within ten hours from the time they forced it." The very day that Wangenheim gave me this expert opinion of Von der Goltz, he asked me to store several cases of his valuables in the American Embassy. Evidently he was making preparations for his own departure. Reading the Cromer report on the Dardanelles bombardment, I find that Admiral Sir John Fisher, then First Sea Lord, placed the price of success at twelve ships. Evidently Von der Goltz and Fisher did not differ materially in their estimates. The situation of Turkey, when these first rumours of an allied bombardment reached us, was fairly desperate. On all sides there were. evidences of the fear and panic that had stricken not only the populace, but the official classes. Calamities from all sides were apparently closing in on the country. Up to January 1, 1915, Turkey had done nothing to justify her participation in the war; on the contrary, she had met defeat practically everywhere. Djemal, as already recorded, had left Constantinople as the prospective "Conqueror of Egypt," but his expedition had proved to be a bloody and humiliating failure. Enver's attempt to redeem the Caucasus from Russian rule had resulted in an even more frightful military disaster. He had ignored the advice of the Germans, which was to let the Russians advance to Sivas and make his stand there, and, instead, he had boldly attempted to gain Russian territory in the Caucasus. This army had been defeated at every point, but the military reverses did not end its sufferings. The Turks had a most inadequate medical and sanitary service; typhus and dysentery broke out in all-the camps, the deaths from these diseases reaching 100,000 men. Dreadful stories were constantly coming in, telling of the sufferings of these soldiers. That England was preparing for an invasion of Mesopotamia was well known, and no one at that time had any reason to believe that it would not succeed. Every day the Turks expected the news that the Bulgarians had declared war and were marching on Constantinople, and they knew that such an attack would necessarily bring in Rumania and Greece. It was no diplomatic secret that Italy was waiting only for the arrival of warm weather to join the Allies. At this moment the Russian fleet was bombarding Trebizond, on the Black Sea, and was daily expected at the entrance to the Bosphorus. Meanwhile, the domestic situation was deplorable: all over Turkey thousands of the populace were daily dying of starvation; practically all able-bodied men had been taken into the army, so that only a few were left to till the fields; the criminal requisitions had almost destroyed all business; the treasury was in a more exhausted state than normally, for the closing of the Dardanelles and the blockading of the Mediterranean ports had stopped all imports and customs dues; and the increasing wrath of the people seemed likely any day to break out against Taalat and his associates. And now, surrounded by increasing troubles on every hand, the Turks learned that this mighty armada of England and her allies was approaching, determined to destroy the defenses and capture the city. At that time there was no force which the Turks feared so greatly as they feared the British fleet. Its tradition of several centuries of uninterrupted victories had completely seized their imagination. It seemed to them superhuman---the one overwhelming power which it was hopeless to contest. Wangenheim. and also nearly all of the German military and naval forces not only regarded the forcing of the Dardanelles as possible, but they believed it to be inevitable. The possibility of British success was one of the most familiar topics of discussion, and the weight of opinion, both lay and professional, inclined in favour of the Allied fleets. Talaat told me that an attempt to force the straits would succeed---it only depended on England's willingness to sacrifice a few ships. The real reason why Turkey had sent a force against Egypt, Talaat added, was to divert England from making an attack on the Gallipoli peninsula. The state of mind that existed is shown by the fact that, on January 1st, the Turkish Government had made preparations for two trains, one of which was to take the Sultan and his suite to Asia Minor, while the other was intended for Wangenheim, Pallavicini, and the rest of the diplomatic corps. On January 2d, I had an illuminating talk with Pallavicini. He showed me a certificate given him by Bedri, the Prefect of Police, passing him and his secretaries and servants on one of these emergency trains. He also had seat tickets for himself and all of his suite. He said that each train would have only three cars, so that it could make great speed; he had been told to have everything ready to start at an hour's notice. Wangenheim, made little attempt to conceal his apprehensions. He told me that he had made all preparations to send his wife to Berlin, and he invited Mrs. Morgenthau to accompany her, so that she, too, could be removed from the danger zone., Wangenheim showed the fear, which was then the prevailing one, that a successful bombardment would lead to fires and massacres in Constantinople as well as in the rest of Turkey. In anticipation of such disturbances he made a characteristic suggestion. Should the fleet pass the Dardanelles, he said, the life of no Englishman in Turkey would be safe---they would all be massacred. As it was so difficult to tell an Englishman from an American, he proposed that I should give the Americans a distinctive button to wear, which would protect them from Turkish violence. As I was convinced that Wangenheim's real purpose was to arrange some sure means of identifying the English and of so subjecting them to Turkish ill-treatment, I refused to act on this amiable suggestion. Another incident illustrates the nervous tension which prevailed in those January days. I noticed that some shutters at the British Embassy were open, so Mrs. Morgenthau and I went up to investigate. In the early days we had sealed this building, which had been left in my charge, and this was the first time we had broken the seals to enter. About two hours after we returned from this tour of inspection, Wangenheim came into my office in one of his now familiar agitated moods. It had been reported, he said, that Mrs. Morgenthau and I had been up to the Embassy getting it ready for the British Admiral, who expected soon to take possession! All this seems a little absurd now, for, in fact, the Allied fleets made no attack at that time. At the very moment when the whole of Constantinople was feverishly awaiting the British dreadnaughts, the British Cabinet in London was merely considering the advisability of such an enterprise. The record shows that Petrograd, on January 2d, telegraphed the British Government, asking that some kind of a demonstration be made against the Turks, who were pressing the Russians in the Caucasus. Though an encouraging reply was immediately sent to this request, it was not until January 28th that the British Cabinet definitely issued orders for an attack on the Dardanelles. It is no longer a secret that there was no unanimous confidence in the success of such an undertaking. Admiral Carden recorded his belief that the strait "could not be rushed, but that extended operations with a large number of ships might succeed." The penalty of failure, he added, would be the great loss that England would suffer, in prestige and influence in the East; how true this prophecy proved I shall have occasion to show. Up to this time one of the fundamental and generally accepted axioms of naval operations had been that warships should not attempt to attack fixed land fortifications. But the Germans had demonstrated the power of mobile guns against fortresses in their destruction of the emplacements at Liége and Namur, and there was a belief in some quarters of England that these events had modified this naval principle. Mr. Churchill, at that time the head of the Admiralty, placed great confidence in the destructive power of a new superdreadnaught which had just been finished---the Queen Elizabeth---and which was then on its way to join the Mediterranean fleet. We in Constantinople knew nothing about these deliberations then, but the result became apparent in the latter part of February. On the afternoon of the nineteenth, Pallavicini, the Austrian Ambassador, came to me with important news. The Marquis was a man of great personal dignity, yet it was apparent that he was this day exceedingly nervous, and, indeed, he made no attempt to conceal his apprehension. The Allied fleets, he said, had reopened their attack on the Dardanelles, and this time their bombardment had been extremely ferocious. At that hour things were going badly for the Austrians; the Russian armies were advancing victoriously; Serbia had hurled the Austrians over the frontier, and the European press was filled with prognostications of the break up of the Austrian Empire,. Pallavicini's attitude this afternoon was a perfect reflection of the dangers that were then encompassing his country. He was a sensitive and proud man; proud of his emperor and proud of what he regarded as the great Austro-Hungarian Empire; and he now appeared to be overburdened by the fear that this extensive Hapsburg fabric, which had withstood the assaults of so many centuries, was rapidly being overwhelmed with ruin. Like most human beings, Pallavicini yearned for sympathy; he could obtain none from Wangenheim, who seldom took him into his confidence and consistently treated him as the representative of a nation that was compelled to submit to the overlordship of Germany. Perhaps that was the reason why the Austrian Ambassador used to pour out his heart to me. And now this Allied bombardment of the Dardanelles came as the culmination of all his troubles. At this time the Central Powers believed that they had Russia bottled up; that they had sealed the Dardanelles, and that she could neither get her wheat to market nor import the munitions needed for carrying on the war. Germany and Austria thus had a stranglehold on their gigantic foe, and, if this condition could be maintained indefinitely, the collapse of Russia would be inevitable. At present, it is true, the Czar's forces wore making a victorious campaign, and this in itself was sufficiently alarming to Austria; but their present supplies of war materials would ultimately be exhausted and then their great superiority in men would help them little and they would inevitably go to pieces. But should Russia get Constantinople, with the control of the Dardanelles and the Bosphorus, she could obtain all the munitions needed for warfare on the largest scale, and the defeat of the Central Powers might immediately follow; and such a defeat, Pallavicini well understood, would be far more serious for Austria than for Germany. Wangenheim. had told me that it was Germany's plan, in case the Austro-Hungarian Empire disintegrated, to incorporate her 12,000,000 Germans in the Hohenzollern domain, and Pallavicini, of course, was familiar with this danger. The Allied attack on the Dardanelles thus meant to Pallavicini the extinction of his country, for if we are properly to understand his state of mind we must remember that he firmly believed, as did almost all the other important men in Constantinople, that such an attack would succeed. Wangenheim's existence was made miserable by this same haunting conviction. As I have already shown, the bottling up of Russia was almost exclusively the German Ambassador's performance. He had brought the Goeben and the Breslau into Constantinople, and by this manoeuvre had precipitated Turkey into the war. The forcing of the strait would mean more than the transformation of Russia into a permanent and powerful participant in the war; it meant---and this was by no means an unimportant consideration with Wangenheim---the undoing of his great personal achievement. Yet Wangenheim, showed his apprehensions quite differently from Pallavicini. In true German fashion, he resorted to threats and bravado. He gave no external signs of depression, but his whole body tingled with rage. He was not deploring his fate; he was looking for ways of striking back. He would sit in my office, smoking with his usual energy, and tell me all the terrible things which he proposed to do to his enemy. The thing that particularly preyed upon Wangenheim's mind was the exposed position of the German Embassy. It stood on a high hill, one of the most conspicuous buildings in the town, a perfect target for an enterprising English admiral. Almost the first object the British fleet would sight, as it entered the harbour, would be this yellow monument of the Hohenzollerns, and the temptation to shell it might prove irresistible. "Let them dare destroy my Embassy!" Wangenheim said. "I'll get even with them! If they fire a single shot at it, we'll blow up the French and the English embassies! Go tell the Admiral that, won't you? Tell him also that we have the dynamite all ready to do it!" Wangenheim also showed great anxiety over the proposed removal of the Government to Eski-Shehr. In early January, when everyone was expecting the arrival of the Allied fleet, preparations had been made for moving the Government to Asia Minor; and now, at the first rumbling of the British and French guns, the special trains were prepared once more, Wangenheim and Pallavicini both told me of their unwillingness to accompany the Sultan and the Government to Asia Minor. Should the Allies capture Constantinople, the ambassadors of the Central Powers would find themselves cut off from their home countries and completely in the hands of the Turks. "The Turks could then hold us as hostages," said Wangenheim. They urged Talaat to establish the emergency government at Adrianople, from which town they could motor in and out of Constantinople, and then, in case the city were captured, they could make their escape home. The Turks, on the other hand, refused to adopt this suggestion because they feared an attack from Bulgaria. Wangenheim and Pallavicini now found themselves between two fires. If they stayed in Constantinople, they might become prisoners of the English and French; on the other hand, if they went to Eski-Shehr, it was not unlikely that they would become prisoners of the Turks. Many evidences of the flimsy basis on which rested the Germano-Turkish alliance had come to my attention, but this was about the most illuminating. Wangenheim knew, as did everybody else, that, in case the French and English captured Constantinople, the Turks would vent their rage not mainly against the Entente, but against the Germans who had enticed them into the war. It all seems so strange now, this conviction that was uppermost in the minds of everybody then----that the success of the Allied fleets against the Dardanelles was inevitable and that the capture of Constantinople was a matter of only a few days. I recall an animated discussion that took place at the American Embassy on the afternoon of February 24th. The occasion was Mrs. Morgenthau's weekly reception---meetings which furnished almost the only opportunity in those days for the foregathering of the diplomats. Practically all were on hand this afternoon. The first great bombardment of the Dardanelles had taken place five days before; this had practically destroyed the fortifications at the mouth of the strait. There was naturally only one subject of discussion: Would the Allied fleets get through? What would happen if they did? Everybody expressed an opinion, Wangenheim, Pallavicini, Garroni, the Italian Ambassador; D'Anckarsvard, the Swedish Minister; Koloucheff, the Bulgarian Minister; Kühlmann; and Scharfenberg, First Secretary of the German Embassy, and it was the unanimous opinion that the Allied attack would succeed. I particularly remember Kühlmann's attitude. He discussed the capture of Constantinople almost as though it was something which had taken place already. The Persian Ambassador showed great anxiety; his embassy stood not far from the Sublime Porte; he told me that he feared that the latter building would be bombarded and that a few stray shots might easily set afire his own residence, and he asked if he might move his archives to the American Embassy. The wildest rumours were afloat; we were told that the Standard Oil agent at the Dardanelles had counted seventeen transports loaded with troops; that the warships had already fired 800 shots and had levelled all the hills at the entrance; and that Talaat's bodyguard had been shot-the implication being that the bullet had missed its intended victim. It was said that the whole Turkish populace was aflame with the fear that the English and the French, when they reached the city, would celebrate the event by a wholesale attack on Turkish women. The latter reports were, of course, absurd; they were merely characteristic rumours set afloat by the Germans and their Turkish associates. The fact is that the great mass of the people in Constantinople were probably praying that the Allied attack would succeed and so release them from the control of the political gang that then ruled the country. And in all this excitement there was one lonely and despondent figure---this was Talaat. Whenever I saw him in those critical days, he was the picture of desolation and defeat. The Turks, like most primitive peoples, wear their emotions on the surface, and with them the transition from exultation to despair is a rapid one. The thunder of the British guns at the straits apparently spelled doom to Talaat. The letter carrier of Adrianople seemed to have reached the end of his career. He again confided to me his expectation that the English would capture the Turkish capital, and once more he said that he was sorry that Turkey had entered the war. Talaat well knew what would happen as soon as the Allied fleet entered the Sea of Marmora. According to the report of the Cromer Commission, Lord Kitchener, in giving his assent to a purely naval expedition, had relied upon a revolution in Turkey to make the enterprise successful. Lord Kitchener has been much criticized for his part in the Dardanelles attack; I owe it to his memory, however, to say that on this point he was absolutely right. Had the Allied fleets once passed the defenses at the straits, the administration of the Young Turks would have come to a bloody end. As soon as the guns began to fire, placards appeared on the hoardings, denouncing Talaat and his associates as responsible for all the woes that had come to Turkey. Bedri, the Prefect of Police, was busy collecting all the unemployed young men and sending them out of the city; his purpose was to free Constantinople of all who might start a revolution against the Young Turks. It was a common report that Bedri feared this revolution much more than he feared the British fleet. And this was the same Nemesis that was every moment now pursuing Talaat. A single episode illustrates the nervous excitement that prevailed. 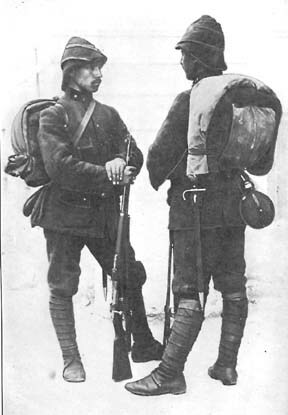 Dr. Lederer, the correspondent of the Berliner Tageblatt, made a short visit to the Dardanelles, and, on his return, reported to certain ladies of the diplomatic circle that the German officers had told him that they were wearing their shrouds, as they expected any minute to be buried there. This statement went around the city like wild fire, and Dr. Lederer was threatened with arrest for making it. He appealed to me for help; I took him to Wangenheim, who refused to have anything to do with him; Lederer, he said, was an Austrian subject, although he represented a German newspaper. His anger at Lederer for this indiscretion was extreme. But I finally succeeded in getting the unpopular journalist into the Austrian Embassy, where he was harboured for the night. In a few days, Lederer had to leave town. In the midst of all this excitement, there was one person who was apparently not at all disturbed. Though ambassadors, generals, and politicians might anticipate the worst calamities, Enver's voice was reassuring and quiet. The man's coolness and really courageous spirit never shone to better advantage. In late December and January, when the city had its first fright over the bombardment, Enver was fighting the Russians in the Caucasus. His experiences in this campaign, as already described, had been far from glorious. Enver had left Constantinople in November to join his army, an expectant conqueror; he returned, in the latter part of January, the commander of a thoroughly beaten and demoralized force. Such a disastrous experience would have utterly ruined almost any other military leader, and that Enver felt his reverses keenly was evident from the way in which he kept himself from public view. I had my first glimpse of him, after his return, at a concert, given for the benefit of the Red Crescent. At this affair Enver sat far back in a box, as though he intended to keep as much as possible out of sight; it was quite apparent that he was uncertain as to the cordiality of his reception by the public. All the important people in Constantinople, the Crown Prince, the members of the Cabinet, and the ambassadors attended this function, and, in accordance with the usual custom, the Crown Prince sent for these dignitaries, one after another, for a few words of greeting and congratulation. After that the visiting from box to box became general. The heir to the throne sent for Enver as well as the rest, and this recognition evidently gave him a new courage, for he began to mingle with the diplomats, who also treated him with the utmost cordiality and courtesy. Enver apparently regarded this favourable notice as having reestablished his standing, and now once more he assumed a leading part in the crisis. A few days afterward he discussed the situation with me. He was much astonished, he said, at the fear that so generally prevailed, and he was disgusted at the preparations that had been made to send away the Sultan and the Government and practically leave the city a prey to the English. He did not believe that the Allied fleets could force the Dardanelles; he had recently inspected all the fortifications and he had every confidence in their ability to resist successfully. Even though the ships did get through, he insisted that Constantinople should be defended to the last man. Yet Enver's assurance did not satisfy his associates. They had made all their arrangements for the British fleet. If, in spite of the most heroic resistance the Turkish armies could make, it still seemed likely that the Allies were about to capture the city, the ruling powers had their final plans all prepared. They proposed to do to this great capital precisely what the Russians had done to Moscow, when Napoleon appeared before it. "They will never capture an existing city," they told me, "only a heap of ashes." As a matter of fact, this was no idle threat. I was told that cans of petroleum had been already stored in all the police stations and other places, ready to fire the town at a moment's notice. As Constantinople is largely built of wood, this would have been no very difficult task. But they were determined to destroy more than these temporary structures; the plans aimed at the beautiful architectural monuments built by the Christians long before the Turkish occupation. The Turks had particularly marked for dynamiting the Mosque of Saint Sophia. This building, which had been a Christian church centuries before it became a Mohammedan mosque, is one of the most magnificent structures of the vanished Byzantine Empire. Naturally the suggestion of such an act of vandalism aroused us all, and I made a plea to Talaat that Saint Sophia should be spared. He treated the proposed destruction lightly. "There are not six men in the Committee of Union and Progress," he told me, "who care for anything that is old. We all like new things!" That was all the satisfaction I obtained in this matter at that time. 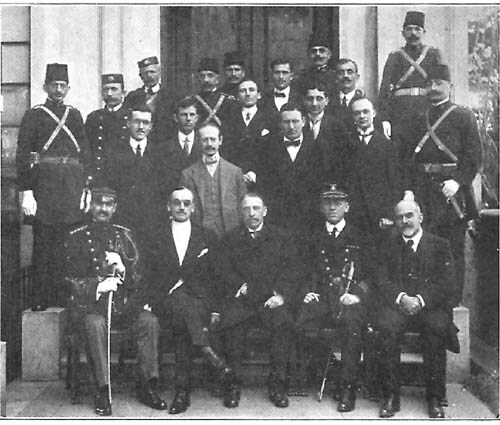 Enver's insistence that the Dardanelles could resist caused his associates to lose confidence in his judgment. About a year afterward, Bedri Bey, the Prefect of Police, gave me additional details. While Enver was still in the Caucasus, Bedri said, Talaat had called a conference, a kind of council of war, on the Dardanelles. 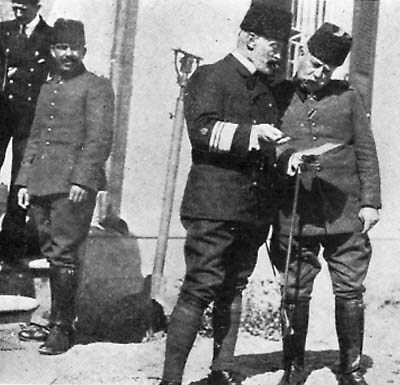 This had been attended by Liman von Sanders, the German general who had reorganized the Turkish army; Usedom, the German admiral who was the inspector-general of the Ottoman coast defenses, Bronssart, the German Chief of Staff of the Turkish army, and several others. Every man present gave it as his opinion that the British and French fleets could force the straits; the only subject of dispute, said Bedri, was whether it would take the ships eight or twenty hours to reach Constantinople after they had destroyed the defenses. Enver's position was well understood, but this council decided to ignore him and to make the preparations without his knowledge---to eliminate the Minister of War, at least temporarily, from their deliberations. In early March, Bedri and Djambolat, who was Director of Public Safety, came to see me. At that time the exodus from the capital had begun; Turkish women and children were being moved into the interior; all the banks had been compelled to send their gold into Asia Minor; the archives of the Sublime Porte had already been carried to Eski-Shehr; and practically all the ambassadors and their suites, as well as most of the government officials, had made their preparations to leave. The Director of the Museum, who was one of the six Turks to whom Talaat had referred as "liking old things" had buried many of Constantinople's finest works of art in cellars or covered them for protection. Bedri came to arrange the details of my departure. As ambassador I was personally accredited to the Sultan, and it would obviously be my duty, said Bedri, to go wherever the Sultan went. The train was all ready, he added; he wished to know how many people I intended to take, so that sufficient space could be reserved. To this proposal I entered a flat refusal. I informed Bedri that I thought that my responsibilities made it necessary for me to remain in Constantinople. Only a neutral ambassador, I said, could forestall massacres and the destruction of the city, and certainly I owed it to the civilized world to prevent, if I could, such calamities as these. If my position as ambassador made it inevitable that I should follow the Sultan, I would resign and become honorary Consul-General. 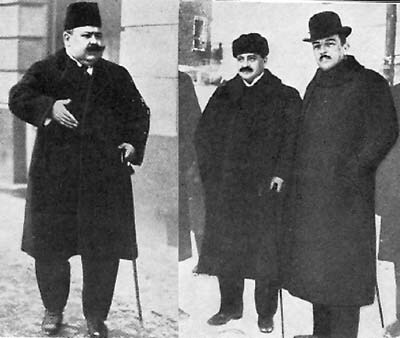 Both Bedri and Djambolat were much younger and less experienced men than I, and I therefore told them that they needed a man of maturer years to advise them in an international crisis of this kind. I was not only interested in protecting foreigners and American institutions, but I was also interested, on general humanitarian grounds, in safeguarding the Turkish population from the excesses that were generally expected. The several nationalities, many of them containing elements which were given to pillage and massacre, were causing great anxiety. I therefore proposed to Bedri and Djambolat that the three of us form a kind of a committee to take control in the approaching crisis. Fig. 29. THE MINISTRY OF WAR. This was the headquarters of Enver Pasha. It was in this building that Enver gave Mr. Morgenthau his promise not to ill-treat enemy aliens. "Will you be modern?" asked the American Ambassador. "No---not modern," said Enver, probably thinking of Belgium, "that is the most barbaric system of all---Turkey will simply try to be decent! They consented and the three of us sat down and decided on a course of action. We took a map of Constantinople and marked the districts which, under the existing rules of warfare, we agreed that the Allied fleet would have the right to bombard. Thus, we decided that the War Office, Marine Office, telegraph offices, railroad stations, and all public buildings could quite legitimately be made the targets for their guns. Then we marked out certain zones which we should insist on regarding as immune. The main residential section, and the part where all the embassies are located, is Pera, the district on the north shore of the Golden Horn. This we marked as not subject to attack. We also delimited certain residential areas of Stamboul and Galata, the Turkish sections. I telegraphed to Washington, asking the State Department to obtain a ratification of these plans and an agreement to respect these zones of safety from the British and French governments. I received a reply indorsing my action. All preparations had thus been made. At the station stood the trains which were to take the Sultan and the Government and the ambassadors to Asia Minor. They had steam up, ready to move at a minute's notice. We were all awaiting the triumphant arrival of the Allied fleet. Chapter Seventeen: "The vulnerability of the British fleet."